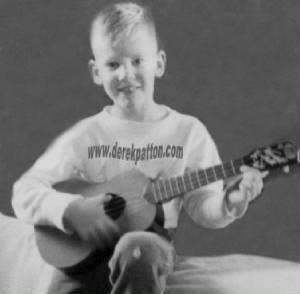 Derek started playing a plastic ukulele at the age of six. After experimenting with numerous tunings on the tiny instrument, it suddenly and without warning snapped in half; emotionally traumatizing the small boy. Months later, he gravitated to his father's baritone ukulele, learning his firstchords. As a young adolescent, his father brought him home a shiny new electric guitar. Derek, who had been swimming at a neighbor's house, gleefully ran over to see the new instrument. Still barefoot and wet from the swim, he reached for the guitar, now plugged into the family stereo, and in one electrifying moment, became painfully aware of the traumatic undercurrents of pursuing a musical life. After recovering from this initial shock, and enthused with new energy, Derek learned the intricacies of the symbolic language used for sound, explored various instruments for its creation, and found his vehicle for musical expression in the guitar. 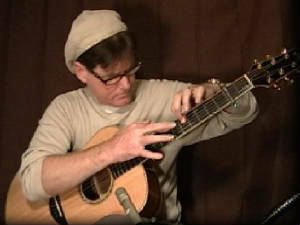 During his teens, through the influence of classically trained pianist and recording artist, Michael Dulin, Derek had the good fortune of meeting classical guitarist, composer, and recording artist, David Walbert, with whom he began the serious study of classical guitar. After years of teaching guitar himself and performing in various ensembles, a duo, and as a solo artist, Derek became frustrated with the music scene; having endured one too many requests to play "Freebird," as well as hearing horrible renditions of "Stairway to Heaven." He left to pursue other interests. Years later, his passion was rekindled after watching a barefoot, steel-stringed, fingerstyle guitarist (Michael Chapdelaine) play to an enthralled group of admirers. Passion merged with conviction, as awaking in the night several months later, he became focused on the parable of the talents (Mt. 25:14-30) and emerged with an inescapable sense of having buried his musical abilities. 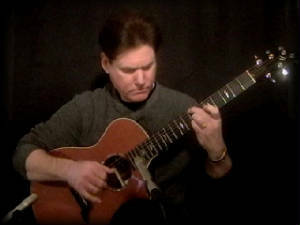 Derek returns now to write original compositions for steel-string fingerstyle acoustic guitar, duly chastened and with shoes on. Derek Patton Radio on Pandora! !